With almost 8,850 meters, the Mount Everest is the highest mountain of the world. If you have always wanted to go on an adventure and climb up the peak of this gigantic mountain, you will soon have the possibility to do that from your living room. There are currently two different companies working on a Mount Everest VR experience. VR EXPLORERS, a media production company based in Amsterdam that focusses on storytelling in VR, is joining the famous adventurer Noel Hannah and his wife Lynn in their second Everest ascension. The adventure is planned for the two months of April and May 2016. The team of VR Explorers (Przemek Siemion, cameraman and Zbigniew Wolny, sound recordist) is joining the adventurer couple during that time. Yesterday (April 28th) the team already reached an altitude of 5,100 m and was visiting the highest monastery in the world, the Rongbuk Monastery. Until the Mount Everest VR Experience gets released, VR Explorers aims at involving the audience with daily updates, pictures and videos on Social Media. 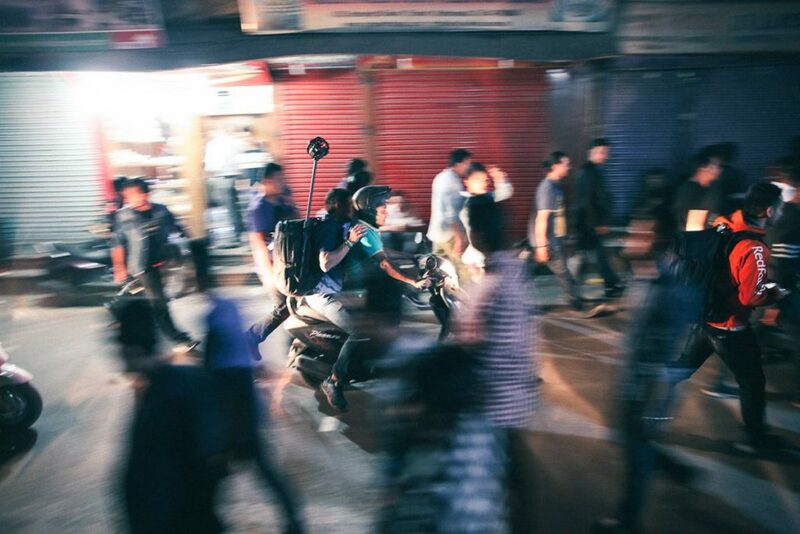 They started their documentation with the preparation process, including all important milestones from getting the right clothing and shoe equipment to the organization of the 6 GoPro cameras, 84 TB of storage for their footage, an Ambisonic microphone (“It is important to capture sounds in 3-dimensional space.”) and much more. If you are interested in following their expedition and learn more about the preparation process, you can check out their Facebook, Twitter or Instagram. The other Mount Everest VR experience, named “Everest VR” is being created by the Icelandic Sólfar Studios, in partnership with visual effects house RVX, Reykjavik-based visual effects and animation house. Compared to the VR Explorers’s project, Sólfar Studios and RVX use a different approach. Thor Gunnarsson, co-founder of Sólfar Studios, says that ” one could record locations like Everest with a 360-degree camera, the resulting experience is a static, passive video experience that just doesn’t do justice to the inherent promise of virtual reality.” They use more than 300,000 high-resolution photos of Mount Everest which were taken by RVX for the drama “Everest” to create a realistic 3D model of the mountain. Dani Einarsson, creative director of RVX, explains that they “put thousands of images into software that triangulates pixels into a point cloud, which is then tessellated to give surface geometry.” To create the Everest VR experience they are using Epic Games’ Unreal Engine 4 technology. Furthermore, an important part of the Everest VR project is interactivity. To help the viewer immerse himself/herself and increase the level of presence, hand controllers are key to the VR experience. Team members will tell you to hold on to a rope, climb up a ladder or look down the edge. Everest VR will be released on HTC Vive when it launches this year. Read here about Jason Evangelho’s immersive Mount Everest VR experience at GDC 2016 (Game Developers Conference in San Francisco). We are sure that after reading this, you also can’t wait to feel that adrenaline and virtually climb up to the top of the world!